While trolling the booths at Interbike Las Vegas, I came across an interesting photo of a contraption that plays a vital role in bicycle industry product safety. It’s a servo-hydraulic Universal Testing Machine (UTM) capable of performing most cyclic fatigue test protocols. Members of Microbac Laboratories, Hauser Division, located in Boulder, Colo., were on hand. Their division is a full-service chemical, mechanical, physical, and microbiological testing laboratory. The photo showed a crank and pedals hooked up to the UTM. “We have seven tests for cranks, spindles, and pedals,” said Russ Willacker, Associate Engineer, “with stress durations ranging from 50,000 to 100,000 cycles.” By applying constant stresses at maximum expected loads, machines can provide much faster, more accurate, documented results compared with real-life road testing. 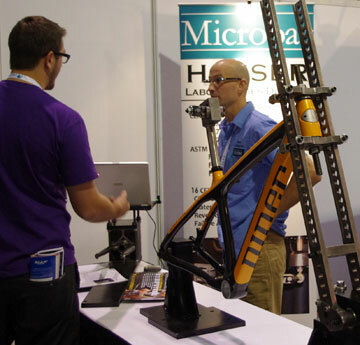 Microbac provides a valuable service for bicycle/component manufacturers desiring to document their product’s durability. While some bicycle companies do their own testing, that sounds to me like the fox guarding the hens. If a part fails under test, it’s more than likely back to the drawing board for the manufacturer. While it’s comforting to know bikes and components are tested before being sold, a company’s dedication to quality is crucial for how long parts last. So who determines how much stress to apply and for what duration? It’s up to safety and reliability standards bodies, such as ASTM — one of the largest voluntary standards development organizations in the world – and the European Committee for Standardization (CEN). While European governments require safety/durability tests, the U.S. government does not. “Most companies do the tests anyway for liability reasons,” said Willacker. How these standards organizations work is a bit of a mystery, but they are an integral part of any industry. Most of their members are represented by a particular industry. So someone who works at Trek, Shimano, Specialized, on so on, will be a member of a particular bicycle standards committee. There will also be engineers on a committee who have no vested interest in a particular company. In many instances, a standard specification will be strongly influenced by the dominant manufacturer. Agreeing on standards can and does lead to disagreements that need to be negotiated among standards committee members. The U.S. bicycle industry adheres to standards set by ASTM and the International Organization for Standardization, (ISO), which has a special technical committee for bikes. CEN, European Committee for Standardization, also has a specific Technical Committee, TC333, that defines European standards for cycles. Some CEN bike standards were developed before ISO published their standards, leading to strong European influences in this area. European cycle standards tend to describe minimum safety requirements, while ISO standards have encouraged companies to make bike parts a particular way so they are interchangeable. He believes the airline industry has the right idea. Airlines routinely schedule parts replacements, rather than chancing a catastrophic fatigue failure. It’s a good policy to keep in mind as your bike parts pile on the miles. This entry was posted on October 20, 2010 at 4:08 pm and is filed under News, Products. You can follow any responses to this entry through the RSS 2.0 feed. You can leave a response, or trackback from your own site.